The historical development of renewable energy resources such as wind and solar has been characterized by one common under-pinning factor in every region on earth; the need for direct financial support in the form of construction grants, accelerated write-offs, production tax credits, and/or feed-in-tariffs. In many areas, including 30 of the 50 States in the U.S., these financial measures have been enhanced by adding Renewable Portfolio Standards (RPS) that require that certain percentages of total electricity generation must be from renewable sources by specified dates, regardless of the cost of achieving those targets. Where these types of supports have been implemented there has been a rapid expansion of renewable electrical generation capacity. So from that perspective these support measures have been successful. However, the financial burden of these measures is beginning to have serious repercussions in jurisdictions such as Germany, Spain, and Italy. In Italy, as in many other jurisdictions, the financial consequences of subsidized renewables are creating an electricity paradox – an electrodox if you will; a large over-supply of generating capacity combined with sky-high prices, insufficient firm reserves, devastating economics for base-load generators, and increasing imports of electricity. The Italian Electrodox costs 14 billion Euros per year for subsidies and the government has been asked for another 1.4 billion Euros for “capacity payments” – essentially insurance payments to non-renewable but reliable generation facilities to make sure they are available on cold, calm nights. In Germany, the costs of “going green” are piling up and the question of who pays for the transition will be a central issue in the fall 2013 elections. Although it is unlikely that there will be a major policy shift in Germany the mechanisms required to deal with the German Electrodox have yet to be identified. Rumour has it that Spain is giving serious consideration to shutting down as much as 15% of the country’s electrical generating capacity, including the most extensive network of Concentrated Solar Plants in the world. The Spanish Electrodox is to blame. The high cost of moving to a sustainable energy economy should not be surprising. As many observers have pointed out, it pales in comparison with the cost of NOT transitioning to a sustainable energy environment. However, I do have a problem with promises that financial support will only be required for a limited time until renewables become cost competitive with non-renewable energy sources. For example, in an effort to maintain the U.S. Production Tax Credit (PTC) for wind producers, a letter was written by the president of the American Wind Energy Association which essentially promises a healthy industry without supporting subsidies within 5 years. The economics of renewable electricity generation will inevitably self-destruct because of the uncontrollable nature of the resources involved. We are already seeing that in Texas where electricity prices are negative when the winds are strong. Because construction costs are “sunken” costs, often supported by significant subsidies, the marginal cost of electricity produced from a wind farm is very low. No non-renewable source can compete when the winds are blowing strongly. As a result it has become very difficult to make the economics work for conventional coal-fired or gas-fired plants in Texas. A similar problem exists in Brazil where several recent electrical generating auctions have only been open to wind generators. In preparation for hosting the World Cup of Soccer and having recently experienced electricity shortages because of drought conditions, Brazil is now preferentially requesting natural gas generation proposals in order to have sufficient reliable and dispatchable electricity. The reality is that the strength of the wind is determined by large weather systems for the most part. Generally speaking, when one wind farm is producing a lot of electricity all neighbouring wind farms will also be producing at a high rate, regardless of whether or not there is sufficient demand to absorb that electricity. It follows that in any kind of market that even vaguely reflects the supply/demand balance the marginal value of wind generated electricity will go down as the number of wind producers goes up. What does that mean for wind producers in the long term? When the wind is not blowing they will earn no revenue and when the wind is blowing they will earn very little revenue. Not really a great business case. 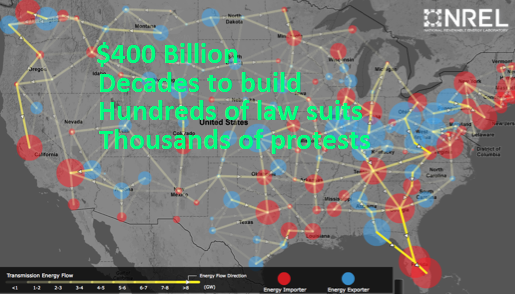 Wind advocates will argue that “the wind is always blowing somewhere!” While there is some truth to that assertion I have previously written that to build a “smart grid” capable of shunting huge amounts of electricity around North America will take decades and hundreds of billions of dollars. The situation with Photo-Volatic (PV) solar is even worse because it is predictable. Although some would argue that the PV electricity production curve is a pretty good match to daytime demand, especially in the summer, it is certainly not a perfect match by any stretch of the imagination. 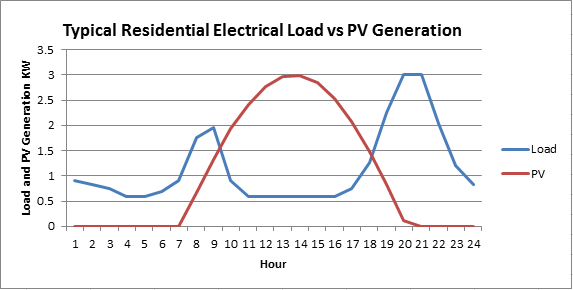 As more and more rooftop PV is installed there will be a larger and larger glut of electricity generation between 10:00 am and 2:00 pm local time. Again, in an environment where Time-Of-Use is reflected in retail prices the marginal value of PV will drop as more and more PV capacity is added to the system. For home-owners hoping to get a relatively quick return on their investment this is not good news. The power they generate will become less and less valuable and the power they continue to have to buy, in the morning and in the evening and night, will become more and more expensive. So what is my point? Only that financial and regulatory support for the development of renewable energy sources is a marathon not a sprint. And in my opinion it would make more sense for us to devote a substantial amount of this financial support to initiatives that can make renewable sources more reliable and more effective. The goal should be to decommission non-renewable generation plants, not have them sitting idle as “spinning reserves” requiring substantial “capacity payments”. Initiatives that will enhance the overall reliability of renewables would include more support for Concentrated Solar Power with Thermal Energy Storage, accelerated R&D to support energy storage technologies, and a greater emphasis on geoexchange and Responsive Demand programs. The economics of renewables, from a pure dollars and cents perspective, will not make sense until hydro-carbons truly begin to run out. If we wait until then there will not be sufficient time or resources to make the transition to a sustainable energy environment. So it is a good thing that we have started down this road and everything done to promote the development of renewables over the past 10-15 years has been positive. A relatively minor course correction to enhance reliability will get us to our desired destination. Its time for another of those blog posts that is a bit “out there”. In this case I would like to propose a new use for an ancient technology. I recently returned from a vacation in France and while there I saw a few things that came together in my mind as a possible source of base-load electrical generating capacity. First, in Normandy, I saw some current generation wind turbines spinning in unison along several of the ridges in the region. What struck me was how slowly these turbines were spinning – about 1 revolution every 4-5 seconds. And yet I know that each turbine was producing at least 1 MW of electricity. It crossed my mind that the technology has advanced to the point where relatively slow revolutions of a generator can produce a significant electrical output. Later that week we moved to Avignon in Provence and I had the chance to walk along the Pont d’Avignon which used to be one of the most important bridges in Europe. Looking down at the Rhone as it swirled around the piers of the bridge I thought about the power of all that moving water. Even though there were no rapids or waterfalls nearby clearly there was a great deal of untapped energy in the flow of that river. 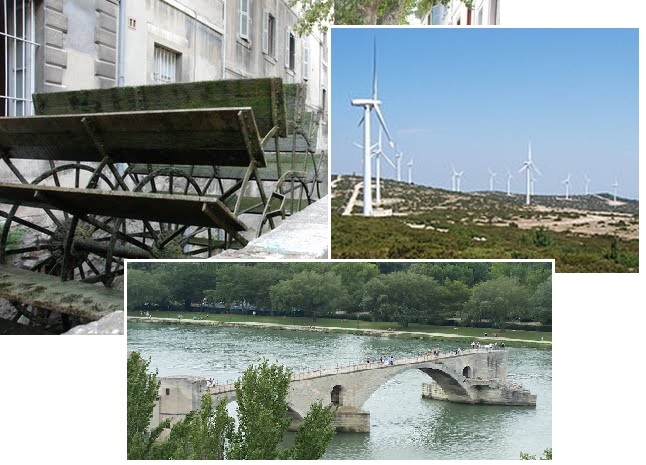 Finally, in the old part of Avignon, I saw a number of very old water wheels along a man-made canal fed by the Rhone. These water wheels used the flow under the wheel rather than having water drop onto the wheel – basically the reverse of how a paddle-wheeler works. The interesting thing was that there were 4-5 of these wheels in series along the canal. Putting these observations together it occurred to me that perhaps a very large water wheel, 30-50 meters or more in length and 2 meters in height, could be placed in a river to tap into the stream flow. Based upon a typical stream current of 1-2 m/sec it would take about 6 seconds to spin the water wheel through 1 revolution, about the same amount of time as it takes a modern wind turbine to spin through one revolution. By connecting this water wheel to a wind turbine it would be possible to generate between .5 to 2 MW of output per water wheel. Many of these units could be placed at intervals down a river in order to multiply the aggregate amount of electricity produced. One of the other interesting aspects of this concept has to do with the large number of older wind turbines that are going to be retired from service in the next few years. The largest example is the refurbishment of the Altamont Pass wind farms in California which will involve the replacement of several thousand older, smaller turbines (in the 200 KW – 500 KW range) with current generation turbines. What can be done with these older turbines, most of which are in perfect working order? Perhaps next generation water wheels would provide a good re-use of these units. The only problem I can see with this concept is the need to allow river traffic to continue without being interrupted by the water wheels. Here again an ancient tactic might work. During the seige of Rome in 537 AD the aquaducts used to supply water to drive the mills in the city were blocked. The Roman leader Belisarius anchored two boats in the Tiber River and suspended a water wheel between them allowing for the continued production of flour. A modern version of this could involve suspending a much larger waterwheel between two floating supports so that only a portion of a river's channel would be blocked allowing river traffic to continue. 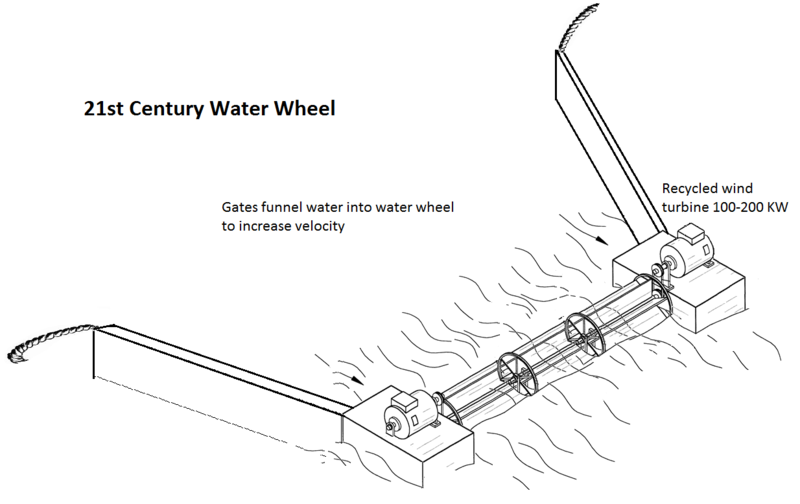 A new generation of water wheel has the potential to add a relatively inexpensive reliable and renewable energy source which can be deployed on all major rivers. Definitely may be a ‘Black Swan’ worthy of consideration. The Tennessee Valley Authority has announced a cap on purchasing of solar power generated by larger Photo-Voltaic installations. The response from regional installers has been typically dramatic. For example, the owner of Sundog Solar declared that this would mean that his company would be "out of business before the end of the year". Tuscon Electric Power has recently cut its PV solar incentive from 75 cents to 10 cents/watt. Local installers predicted "a steep drop-off in sales at the 10-cent level". The message is clear. Without significant direct subsidies the PV solar industry cannot survive. PV solar advocates argue that the non-renewable sector has benefitted from heavy subsidies and infrastructure support for almost 100 years. The ability to write off all exploration expenditures, public funding of port facilities and road networks, and government R&D are all identified as direct and indirect subsidies to the oil & gas industry. I actually have no argument with that accusation. There is a lot of subsidization of the oil & gas industry. However, there is one huge difference between those subsidies and the ones currently enjoyed by the PV solar industry – a difference that PV solar advocates completely ignore at their peril in my opinion. Oil & gas and the products they produce, including automobile gasoline, aviation fuel, lubricants, and plastics are all absolutely essential to the health of our economy. Without them our daily lives would be impacted in a very serious way. Anyone old enough to remember the line-ups at gasoline stations in 1979 understands how reliant we are on these products, for good or ill.
Having worked in the oil and gas industry for more than 20 years I can state unequivocally that any reduction in the above-mentioned subsidies would translate directly into higher prices for the end products produced. It’s as simple as that. And since the vast majority of North Americans use these products any reduction in “subsidies” would simply be converted into higher commodity prices with little or no savings to the average American or Canadian. Can the same be said of PV solar? Not at all. In almost every jurisdiction in North America the local electrical utility already had sufficient dispatchable generating capacity, including a healthy reserve, to supply their customers. The regulated environment they operate in required that. So the introduction of the PV generation that has been added into the mix over the past 10 years has been 100% surplus to existing demand. In a truly free market this surplus electricity would find it impossible to compete with the reliable base-load electricity in place already and therefore would not have been developed. For valid public policy reasons including the threat of climate change, an over-dependence upon foreign crude oil, and the excessive use of a non-renewable resource, it was decided that extra support was needed to encourage the development of renewable electrical generating capacity. I actually have no complaint about that either. PV solar generation does not match electricity demand in any significant way despite many statements by PV solar advocates to the contrary. In fact, if we were to implement Time-of-Use (TOU) electricity pricing (which most green energy advocates including myself feel we must do) customers that had installed PV would find they saved almost nothing on their electricity bills because they would generate very low priced electricity and would be paying for high priced electricity. PV solar fades away to nothing exactly at the time the demand curve starts to rise sharply in the early evening. It follows that some other renewable energy source will have to be relied upon in the long run to meet the peak demand in the evening and into the night. That source doesn’t exist yet but would likely be wind generation with some combination of a continental smart grid and energy storage. Logically, if that “other” renewable energy source can meet peak demand it can certainly meet non-peak demand so that, once again, PV solar would be 100% surplus to requirements. In the meantime, PV solar is simply displacing non-renewable generation sources during off-peak times. That means that less coal and natural gas is being burned to generate electricity. Personally I think that is a good thing. But the cost of running the existing coal-fired and natural gas-fired plants has not been significantly reduced. They were designed to be run 7x24x365 and that was an underlying assumption when the construction of these plants was financed. As a result they can no longer be run profitably and that is an unsustainable situation in either regulated or deregulated markets. And yet, it is impossible to shut any of these plants down because of the unreliability of wind and PV solar. The result? Taxpayers and ratepayers will have to pay some sort of capacity fee to keep the non-renewable plants running inefficiently on standby as “spinning reserves”. They will also have to pay for the construction of new PV solar and wind generation and for the grid improvements required to tie in new renewable sources and for the various subsidies and feed-in-tariffs required to make renewables viable. Unlike the "subsidies" provided to the non-renewable industry the removal of PV solar incentives would actually reduce the overall cost of electricity and might, in fact, provide more support for other renewable energy sources that would better match peak demand patterns. At some point in the very near future this “house of cards” will come tumbling down. 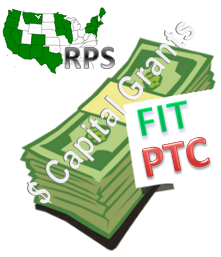 Artificially concocted RPS requirements will be met, the budget for subsidies will run out, and rate-payers will say “enough is enough”. I would argue that process has already started. As soon as the demand for PV solar declines significantly there will be too many contractors chasing too few customers which will lead to a major disruption in the industry. The result would be job losses and possibly a serious reduction in the expertise with this technology. The PV solar industry needs to fess up to the shortcomings of this technology immediately and begin to work to address these shortcomings. As I have suggested in an earlier blog one way to really make solar work as a base-load supplier would be to pair large PV solar installations with Concentrated Solar Power (CSP) with Thermal Energy Storage that would only be used as PV started to fade in the afternoon. That combination could provide relatively economical 7x24x365 solar power. For residential installations PV solar should be equipped with on-site battery storage of between 10-20 KW-Hours. Of course, the ugly truth of that approach would be that it would probably double or triple the cost of the installation which would make it unpalatable for most customers. The solar industry should agitate for redirection of some of the existing financial incentives to go towards battery storage. Germany has recently initiated such a program. I have personally been an advocate for solar power for more than 30 years. But it has to be introduced into the grid in a sensible way that will actually allow for the decommissioning of non-renewable electricity generating assets. I don't believe that is happening today and I think the industry is in for a "Humpty Dumpty" sized fall.